The Rossi Model R97206 is a .357 Mag, 6-inch-barreled six-shooter that will deliver the message loud and clear! At the muzzle, the underlug has been relieved to the rear for easy holster use, and there is a solid top rib. 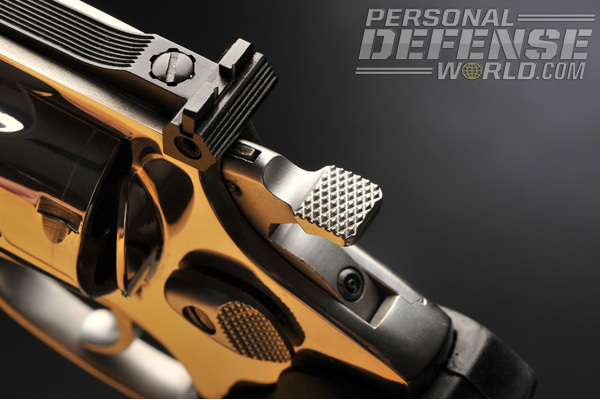 For deliberate double-action shooting, the trigger is smooth, wide and contoured for easy use. Almost any small screwdriver will fit the elevation screw for the rear sight. The forward lock for the cylinder is not at the end of the ejector/ejector rod, but locks securely into the frame. 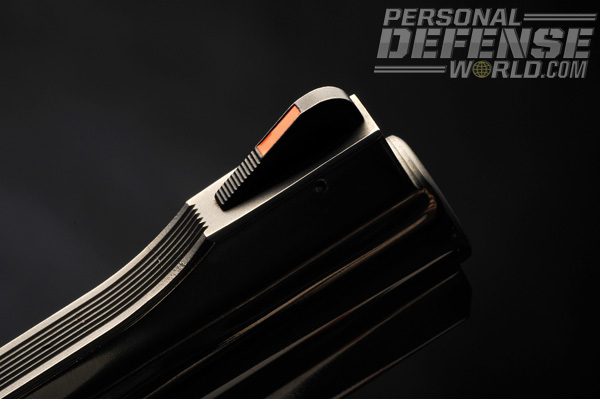 The serrated front sight blade is a ramp design and includes a bright red-orange insert. The rear sight has horizontal serrations to keep the glare of the sun from ruining your sight picture. Note the notch has a white outline. the energy of its predecessor. From here, new revolvers joined the S&W lineup, and soon many other manufacturers jumped on the bandwagon to supply the crowd of knowledgeable shooters waiting for the new handguns. 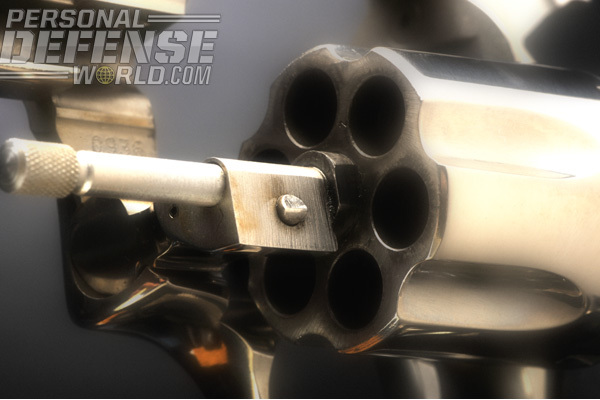 For 20 years, the .357 Mag held the title as the most powerful handgun cartridge. Then the .44 Mag came along. 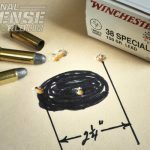 Yet, regardless of the newer and more powerful handgun cartridges, the .357 Mag has remained a favorite of novices and veteran shooters alike due to its mild recoil and impressive accuracy. Part of the .357’s allure is the wide array of factory ammunition available, the abundance of components for handloaders, the ability to use either mild .38 Specials or heavy magnum loads in the same gun, and the sheer volume of .357 handguns on the market today. One of the most versatile guns I’ve come across is from Rossi Firearms. It’s always nice to learn the history of a company, and Rossi Firearms has plenty of it. 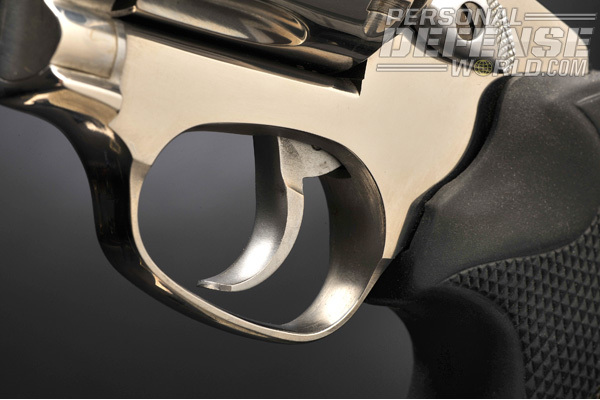 Started in 1889 by Amadeo Rossi, the company has progressed into many types of firearms. Rossi’s guns were originally imported by Interarms of Alexandria, Virginia, and are, as of December 1997, now imported through BrazTech International. Rossi firearms are currently manufactured at its San Leopoldo, Brazil, facility, as well as by Forjas Taurus, which purchased the rights and precision equipment to manufacture Rossi products under a contract with Rossi. 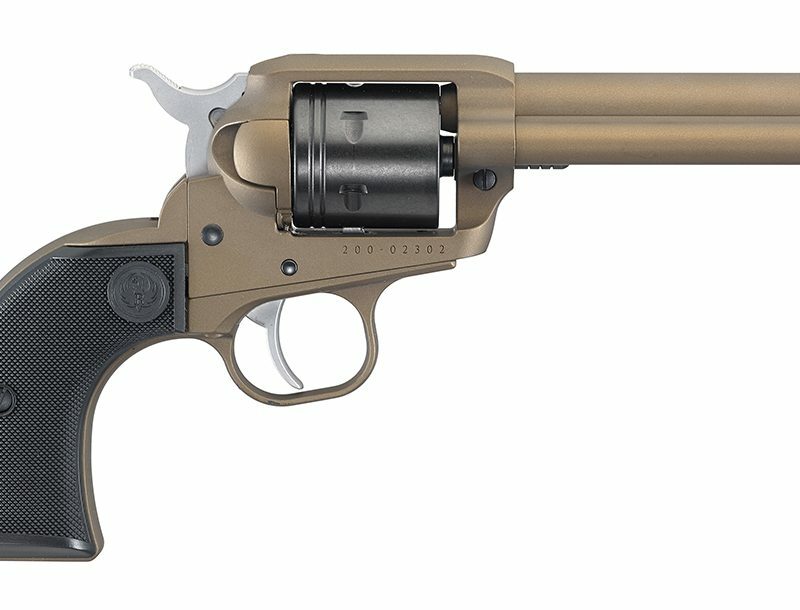 If you have trouble finding a Rossi revolver, the Taurus Model 66 is basically the same gun and in all probability made on the same machinery. 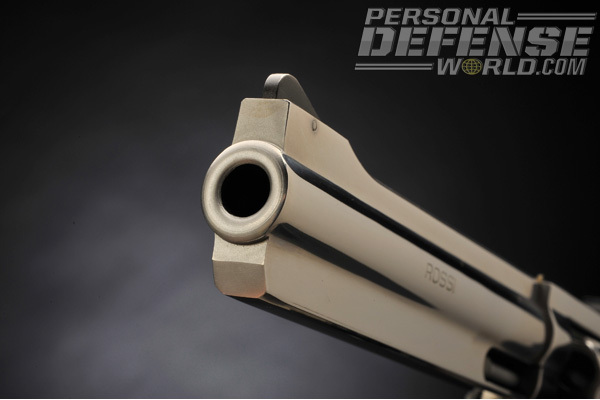 Those who were fans of the S&W Model 19 will remember it well. The gun had trim lines, was made on a medium frame and was chambered for the .357 Mag. It was an all out favorite of both law enforcement and sportspersons. With that gun gone, the Rossi is a strong contender to take its place. For testing, I received the Rossi Model R97206 with a 6-inch barrel in stainless steel, complete with recoil-absorbing grips and a weight near identical to the S&W Model 19’s. The Rossi Model R97206 is one gun you can count on when you open the box. Built on a medium frame, the balance is perfect in the hand, especially when the gun is fully loaded. The rubber grips fit the hand very well and incorporate finger grooves that actually give you a better purchase on the gun when shooting higher velocity, full-house magnum rounds. While I, for one, am not particularly enamored by rubber grips, aftermarket grips in fancy wood are out there. The finish on the gun is even all around and done in a polished stainless that is perfect for all-day outdoor use. 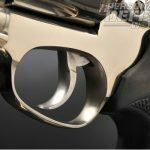 The trigger, hammer and cylinder release are chrome-plated for durability and add a nice contrast to the gun’s appearance. 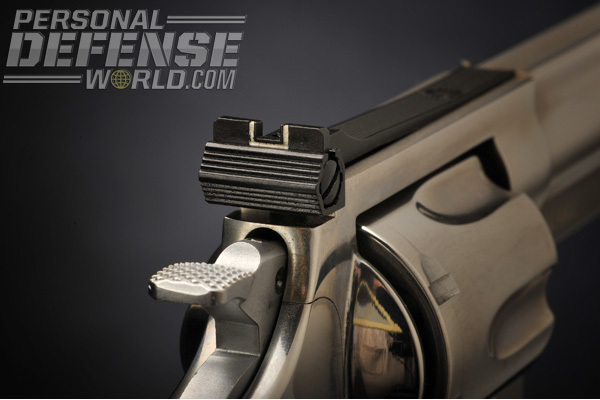 The target trigger is wide, smooth and perfect for deliberate double-action shooting. 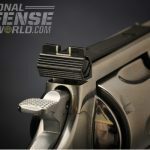 While the single-action trigger pull was with-in the acceptable limit of 3.5 pounds, more importantly, it broke with absolutely no slack before the hammer fell. The double-action pull had the traditional stacking problems and broke at 16 pounds. In defense of the heavy double-action pull, it did release with a minimum amount of slack at the top of its arc, giving it the feeling of a much lighter pull. When shooting the gun, the distance from the hammer and trigger is very comfortable, and the design of the triggerguard is large enough to accommodate winter gloves if desired. The hammer is checkered, has a width of 0.395 inches, roughly between a target and service hammer, and is supported by a transfer system for safety. On the base of the hammer is the proprietary Taurus Security System that locks the gun with the hammer down. Activated by a simple Allen key supplied with every gun, one clockwise turn of the key (past a minor detent) disables the revolver by simply raising a small nub so it interferes with the frame and makes it impossible for the hammer to continue its downward or rearward movement. For shooting, turn the key in the opposite direction to ready the gun again. A slight push forward of the cylinder release opens the six-shot cylinder. The cylinder itself measures 1.465 inches in diameter and 1.56 inches in length, which is comparable to others of its ilk. Gone are the days of countersunk charge holes (perhaps for safety reasons). With today’s modern metallurgy, guns today are made to bang in nails! There are six flutes around the periphery, and the charge holes are finished well enough to ensure easy extraction. The front of the cylinder has been polished and rounded off for holster use, and the cylinder spins on the extractor rod as if it is on ball bearings. The cylinder locks both at the rear of the frame and at the yoke, rather than at the front of the ejector rod. 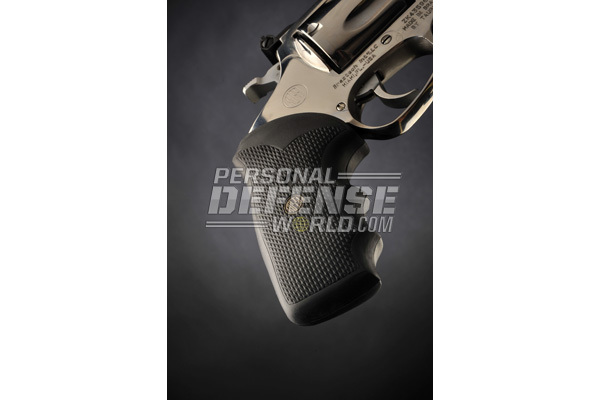 Spent rounds in .38 Special are almost fully ejected from the gun; however, when using .357 Mag ammunition, you’ll need a brisk rearward action on the ejector rod to clear all of the cases. Timing is not quite perfect as there is only slight evidence of a drag mark on the cylinder’s periphery. The barrel is rated as heavy, in-corporates a full underlug for balance and includes a protected ejector rod on all models. Interestingly, when the gun is fully loaded with six rounds, the balance point is directly in the hand. Out front, again for holster use, the underlug has been angled downward so as to not interfere with placing the gun back into your leather gear after shooting. 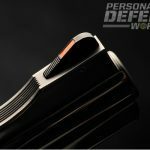 The gun is equipped with a premium adjustable rear sight assembly with a blade that is positioned vertically but with horizontal serrations to help counteract any glare effects. The rear sight is adjustable for elevation and windage and comes complete with a pair of screws that are large enough to turn without having to use a miniature screwdriver or the tip of your pocketknife. The notch is more than adequate and surrounded by a white outline. The front sight is ramped and serrated for glare and has a red-orange insert, which is easy to pick up regardless of the background color. 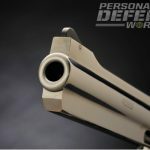 While we are focusing on the 6-inch version, Rossi also makes three models in .38 Special, including a pair of guns with 2-inch barrels and one with a 4-inch barrel. 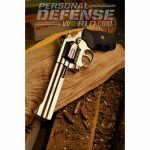 As for .357 Mag models, Rossi’s offers four guns, two with a shorter barrel in blue and stainless, one with a 4-inch barrel and one with a 6-inch barrel like the gun tested for this article. 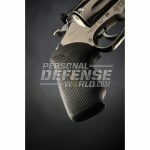 Most all are available in carbon or stainless steel, with or without adjustable sights. 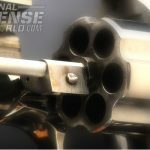 Your ammunition choices in .38 Special and .357 Mag for these Rossi revolvers are huge, and that is why both the guns and the .357 caliber are so popular. 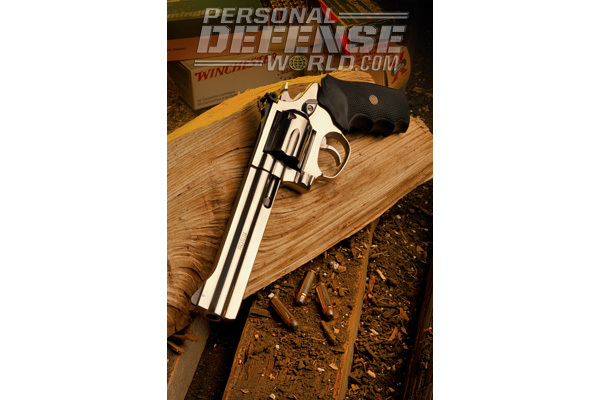 At the range, the Rossi Model R97206 proved its mettle. For trail use, hiking, hunting or as a backup, the gun was excellent. The gun is easy to shoot, readily fits into a compact or waist holster and is the right size and weight to confront the recoil of full-house loads with magnum ammunition, though with a caveat. 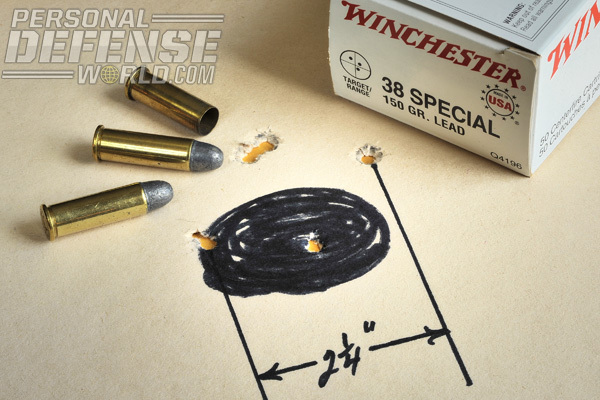 Like others of its ilk, .38 Specials are a pleasure to use, but a steady diet of .357 Mag ammunition will surely wear down the shooter in a short time, especially with heavy bullets and full-house loadings. The rubber grips do soften the blow, but keep in mind this is a medium-framed gun firing off bullets in the 158-grain weight. If I were taking it on a trip, I would practice shooting the gun so as to get used to the sensation and moderate kick. Other than that, I found the Model R97206 great fun to have around. 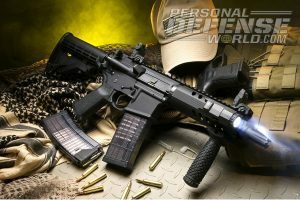 Owing to its bright finish, it is also a solid option as a home defense gun—intruders will quickly think twice once they get a good look at the glint of this gun. For deliberate shooting, the trigger is more than I need—rarely do I use the double-action shot, albeit for the worst of times. Along with the crisp trigger, the sights stand tall among others in its class, and for the price point, the Rossi rates very high on my list of suitable outdoor handguns. I know guns are tight in the market-place, so don’t be put off by the lower price tag of this gun. You are not substituting something of lesser value just to have a gun around the house or campsite. This Rossi in all its variations is a good product and backed by Taurus and its limited lifetime service policy and Internal Locking System. If I were you, I’d go for it! For more information, visit rossiusa.com or call 800-948-8029. 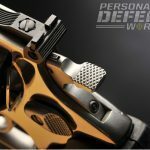 To get this issue, visit https://www.personaldefenseworld.com/subscribe/.